The modern TCA standards provide a basis for fast telecommunication applications. However, high data transfer rates are also required in complex industrial applications. Such applications are found in machine control and process control systems, for example. In addition, a large demand for systems operating under harsh conditions can be seen due to the need to find future-proof successors to existing real-time systems (such as VMEbus) in the transport industry, the aerospace industry, the maritime sector, and for military applications. The MicroTCA standard could be a good choice here, since it offers benefits such as high modularity, a small mechanical form factor, self-diagnostics, and high performance. However, some modifications are necessary before such applications can take advantage of the system benefits of MicroTCA, because MicroTCA is a telecom standard designed for stationary applications that usually operates in air-conditioned rooms. The Venture Development Corporation (VDC, Massachusetts) predicts that the market potential for MicroTCA, outside the telecommunication industry, will be even larger than for telecom applications, and will develop even faster. The turning point is expected to occur as early as the end of 2008, and the value of this external market is said to be 40 to 80% larger than the market in the communication sector. To avoid creating any incompatibility with the essential features of the existing standard when making the necessary adaptations, the PICMG has been entrusted with this task. The MicroTCA.1 – Rugged MicroTCA Air Cooled Specification working group was formed in early 2007. It also incorporates the basic activities of the special interest group, which has been active since 2005. The working group consists of specialists from 41 companies with worldwide recruitment, who are working to develop an enhanced standard. Extension of the standard in the direction of conduction-cooled systems (for aviation and military applications) can also be expected. For hardened applications, Elma can create solutions using components, enclosures, backplanes and complete basic systems based on many decades of experience in development, optimisation and fabrication. In addition to high-quality customer-specific solutions, Elma has created a standard for such systems and made it available to their customers quasi off-the-shelf in an extensive range of products. A unique feature of the racks is the frame construction, which optimally implements the ‘commercial off-the-shelf’ (COTS) concept. It collectively enables realisation of diverse, robust but nevertheless relatively lightweight solutions with a favourable price/performance ratio. Expert support and suitable hardware for form-factor and functional testing for the new ruggedised MicroTCA application area should also be made available to customers and business partners as quickly as possible. Consequently, it was a logical step for Elma to start conducting qualification testing oriented towards hardened systems for this progressive technology at a early stage. The objective of the tests was to demonstrate how well Elma’s MicroTCA systems could withstand vibration and shock loads. The duration and intensity of these stress factors are defined in mandatory terms in test specifications and MIL standards for equipment used under aerospace conditions or in military applications. A ruggedised MicroTCA system as described below was put together for these tests. 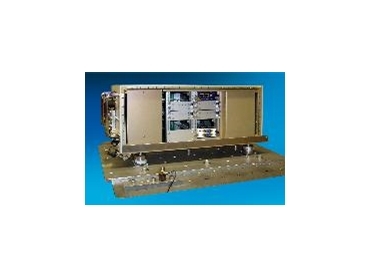 A MicroTCA card cage was integrated in an ARINC 404A Full-Size ATR Long Enclosure, such as is used in commercial and military aviation. The resulting system fulfils the shock and vibration requirements of the MIL-STD 810 E standard and the electromagnetic interference requirements of the MIL-STD 661. The Advanced Mezzanine Cards (AMCs), which are the functional modules of the MicroTCA standard, were fitted with modified front panels so they could be secured to the profiles with screws. Where modification of the front panel was not desirable or not possible, the cards were secured using additional washers that extended over the frame profile and the standard front panel and thus provided the necessary fixation of the functional module in the card cage. The backplane used in the arrangement can hold six AMCs, one MCH (MicroTCA Carrier Hub; part of the system equipment) and one power module. The enclosure can be fitted with shock absorbers if necessary in order to dampen the forces acting on the system. Modules in full-size format were used as electrical load cards. They are compatible with the MicroTCA.0 1.0 specification. In order to be recognised by the Intelligent Platform Management Interface (IPMI) and supplied with operating power, these load cards must also have IPMI functionality (load cards without this functionality are ignored in MicroTCA systems). This new Elma product is also available off the shelf in the standard version, and can be used by customers for practical testing. The mechanical load cards are based on the above-mentioned electrical load cards, including IPMI functionality. However, the electrical load resistors are removed and replaced by mechanical components of the same weight, with a mass of 264 g (MicroTCA.1 D05 specification) fitted. A NAT-MCH-GbE module was used as the system controller. Its flat cable was secured with silicone adhesive. The large components of the power module (such as electrolytic capacitors) were also secured with silicone adhesive. As the Yamaichi connectors are fixed with screws on the backplane they ensure electrical contact to the backplane. All components were tested by the Fraunhofer Institute ICT in Karlsruhe, Germany using suitable test machines. The vibration and shock tests were performed according to the IEC 61587-1 and VITA 47 standards in six axis (three spatial axis, with the system rotated by 180 degrees for each axis). After each test session, the entire system was inspected for mechanical and electrical damage. An electrical test was performed to check the functionality. For this purpose, the fully configured system was started up. Activation of each card was taken as an indication of the presence or absence of damage. All slots started without any errors after all of the sinusoidal vibration tests. After the random vibration tests, slots in the X and Y axis booted automatically and in the Z axis, two slots did not boot automatically but did after the cards were pulled and reinserted. An additional random vibration test with the system operating was performed in the Z axis. The system continued to operate during this test. All slots started without any errors after the shock tests had been completed. The fixation method selected by Elma was to use screws to secure the AMCs to the system profiles. Mechanical problems did not occur with this form of fixation. Even the load cards fitted with 264-gram weights were held correctly in place. Electrical tests completed after the vibration and shock tests had been undertaken showed that the cards were not damaged and that they fulfilled their functions without any restrictions. As a result of these tests, Elma will introduce special card guides with additional retention functionality in order to enhance operational reliability, especially under harsh conditions (an application for design protection as a utility model has been made). In this way, MicroTCA systems can be used for applications that require ruggedised electronics, such as for military and aerospace use. Only minor modifications to the standard AMCs are necessary for the solutions proposed in the first two points above. This means that these modules retain the advantages of modularity and suitability for general-purpose use. To maintain reliable electrical contact, the AMCs must be secured to the frame for use under ruggedised conditions. Aside from the options described above, a system using guide pins has occasionally been proposed in the industry. This solution approach was not tested in the described tests. The challenges posed by ruggedised operation cannot be met by the AMCs or the overall systems without some sort of mechanical modification. The plug-and-socket connectors on the backplane and the gold plating of the AMCs must be further refined for long-term use. The AMC’s pads and connectors fulfilled their function in the individual tests, which had a maximum duration of 30 minutes. However, a critical assessment of the results suggests that tests extending over a considerably longer length of time (which would certainly correspond to the real situation in long-term use), are likely to result in mechanical problems that endanger reliable operation with these components. This arises from the specific form of construction of MicroTCA systems. For cost reasons, electrical connections are made using connectors fitted to the backplane and gold-plated pads located directly on the AMC circuit boards, instead of using two-part plug-and-socket connectors. Due to the compact mechanical construction, 170 connections must be routed via this connector over a width of only 73.5 mm, or as many as 680 connections over the same width for the MCH. As a result, the tolerances that must be maintained for electrically reliable operation lie at the limit of what is possible with regular mass production. The consequence of even the slightest motion or material fatigue in the connector is immediate failure. The tests also showed how an effective remedy to this problem could be devised. All findings from the tests will be incorporated in the MicroTCA product line in the form of product enhancements and practical improvements. Elma’s ruggedised MicroTCA is available from Dedicated Systems Australia .